Friday’s gold trading session ended with a small hammer candle with a narrow body, which came as a welcome relief to gold bulls following two days of sharp declines. With the gold spot price now well below all three short term moving averages the outlook at present remains at present mildly bearish, however, technically it is interesting to note that Friday’s low bounced off a similar price point as in mid December from where we saw a minor recovery. In order to regain the highs of late November the spot gold market has several hurdles to overcome, the first of which is to break above the $1150 per ounce price level where potential strong resistance has now been created. 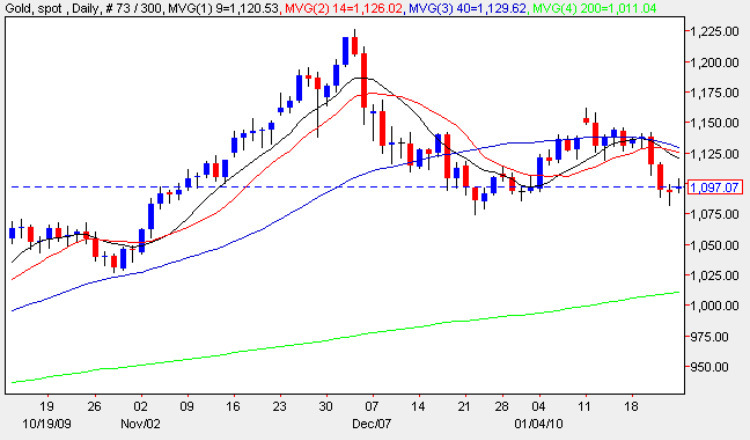 Should this break be achieved and combined with support from all three moving averages then we could see a resurgence in the spot gold market in due course but this could take some time. In the meantime it would appear that we are in for a further period of sideways price action between the price outlined above and the current price at $1100 per ounce.